You can put your box of tissues firmly away and open up your broken heart once more. Dani Dyer and Jack Fincham, the most beloved Love Island pairing of all time, are reportedly still an item and the truest love ever to be found in reality TV land may not have withered away after all. This shock twist in the fairytale has come from straight the mouth of the other Danny Dyer; Dani’s father and ultimate Eastenders geezer. They’ve had a row, she’s got a bit emotional and I think she has whacked that [message] up and immediately regretted it. I don’t know what was going on but I can tell you now, they’re sweet. They’re sweet as. They’ve had a little argument as we all do, we all have tear ups. It is okay, it is all sweet. 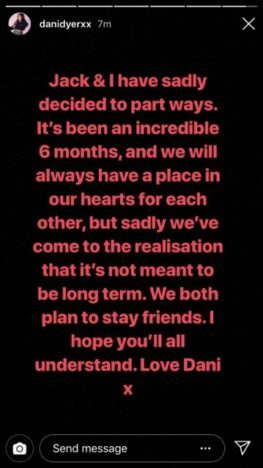 Although we have yet to hear confirmation from Jack and Dani, this latest news will now doubt bring a little ray of hope to those who have followed their love story over the last few months. Don’t do this to us again guys, our hearts cannot take it!